Paul Kartinen is a concerned U.S. citizen. 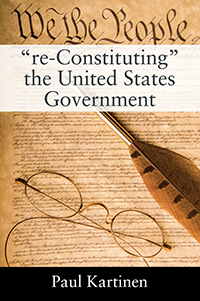 As a retired engineer, he took the time to make a terrible mistake: reading the U.S. Constitution and observing present day federal government activities. Paul is not a politician, political science academician, investigative journalist, or “Constitutional scholar.” However, he can read and observe and think! He is concerned about the future and shares his controversial thoughts in these few pages. He may be wrong, but then again he may be right. Created in 1787 the U.S. Constitutional system encouraged the country’s development for some 130 years, resulting in one of the better (if not the best) societies/civilizations in human history. Well, the U.S. Constitution has been abandoned, or maybe better stolen, by ignorance of the concept and/or misinterpreting the document as written. It is clearly the time to review some of the difficulties generated by that ignorance/misinterpretation. The Constitution’s writers originated a great concept, but left “holes” in the document that misguided people have taken advantage of. Can we get the U.S. back on track? The trip back will be difficult, but we’ve got to try something; the last several decades of “non-Constitutional” skulduggery have imposed a disastrous course for the greatest society ever created in human history – a steep downhill slide into an abyss! Maybe, if we’ve got enough guts, we can recover?